Home Asia Australia Singapore World Singapore Day!! - Celebrate Down Under!! Melbourne, Australia is often regarded as the 'multicultural capital' of the world, and with good reason. Residents from more than 140 nations live side-by-side in Melbourne, which makes it one of the world's most harmonious and culturally diverse communities. To celebrate the thousands of residents, new-Australians, students and visitors from Singapore, Melbourne will be hosting 'SINGAPORE DAY' at the Sidney Myer Music Bowl, on 4th October, 2008. Come down to Singapore Day with fellow Singaporeans, and display your group identity any way you like! The biggest group to turn up for Singapore Day stands to win attractive prizes! Students no longer come to school to learn from us. Now they learn with us. The Ministry of Education (MOE) has developed a more holistic and engaging classroom environment called SEED (Strategies for Effective Engagement and Development) for Primary School students. So vist us on Singapore Day and let your children (ages 6 to 9) have the SEED experience first hand. Classes begin at 11:30am, 1:30pm & 3:30pm. Explore. Exchange. Be Entertained. That is the vision for the Singapore of the future that is exemplified by Marina Bay.Visit us on Singapore Day and come see for yourself how Singapore is morphing into a city of constant vibrancy and life. Our popular home grown talents will be presenting a whole slew of exciting performances. We have arranged for one of our partners – Best Travel – to assist you in getting to Melbourne from the other Australian cities. Best Travel has more than 20 years of experience in inbound and outbound travel planning, handling both corporate and independent travellers. Based in Melbourne, the company also specialises in organising tours in the Victorian region, Australia. To find out more about their travel packages, click here. Alight at Flinders Street Station. Walk across the Princess Bridge (St. Kilda Road) over the Yarra River towards Queen Victoria Gardens. Cross Linlithgow Ave into King's Domain where the Sidney Myer Music Bowl is located. If you are driving to the Sidney Myer Music Bowl, the nearby Arts Centre Car Park is open 24 hours a day, seven days a week. It offers undercover parking for 850 vehicles.Wheelchair access is available on all levels of the car park. Entry to the Arts Centre Car Park is located on the corner of Sturt & Kavanagh Streets Southbank and is easily accessed from St Kilda Road / Southbank Boulevard, and Alexandra Avenue / City Road. Take the train to Flinders Street Station. 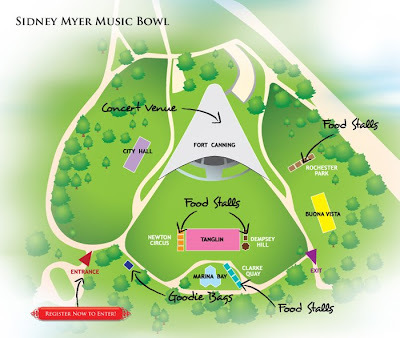 From the station, the Sidney Myer Music Bowl is a couple of minutes’ walk down St Kilda Road. The free MelbourneCity Tourist Shuttle runs in a loop through Melbourne's CBD every 15 minutes. (b) Bus Stop 1 (near Hamer Hall) on St. Kilda Road Cross to the other side of road and walk down St. Kilda Road towards King's Domain (passing the Floral Clock landmark). Cross Linlithgow Ave into King's Domain where the Sidney Myer Music Bowl is located. Should be, if I'm not wrong about it!